A successful business and civic leader, Joel Ferguson has been an effective coalition builder throughout his life. A 1956 graduate of Lansing Sexton High School, Joel enlisted in the U.S. Marine Corps after high school, serving two years and then enrolled at Michigan State University in 1959. A dedicated student and hard worker, Joel financed his education by working nights on the Oldsmobile assembly line in Lansing for six years. Wanting to make a contribution to his community and to young people, he spent the next two years teaching and later became the director of the Greater Lansing Urban League OJT program. Boy’s Club, Arthritis Foundation and Junior Achievement. Joel has mentored many of Lansing’s young people, both athletes and non-athletes, about the importance of education and civic duty, and the value of each in one’s personal and professional lives. 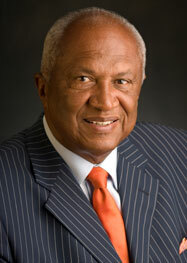 Joel is currently the Chairperson of the Michigan State University Board of Trustees.